First, top business leaders abandoned President Trump. Now, major organizations are canceling plans to hold events at the president's resort in Florida. The Cleveland Clinic, the American Cancer Society and American Friends of Magen David Adom have all axed plans for galas at Trump's private Mar-a-Lago club. It will be the first time in eight years that the Cleveland Clinic has not held its fundraiser at the resort in South Florida, which Trump has dubbed the Winter White House. The cancellations follow the spectacular implosion of Trump's business councils this week over the president's comments that drew a moral equivalence between white supremacists and left-wing protesters. 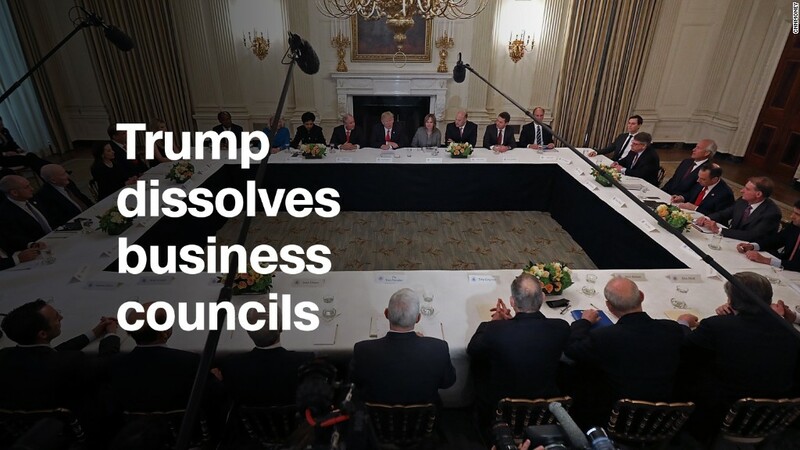 The collapse of the councils was an extraordinary rebuke to a president who prides himself on being business-friendly. High-profile CEOs like JPMorgan Chase's (JPM) Jamie Dimon have publicly slammed Trump's reaction to the violence that broke out at a white supremacist rally in Charlottesville, Virginia, on Saturday. "We thank the staff of Mar-a-Lago for their service over the years," the Cleveland Clinic said in a statement. It did not give a reason for its cancellation. The announcement was reported earlier Thursday by the Cleveland Plain Dealer. A few hours after the Cleveland Clinic's announcement, the American Cancer Society followed suit. The American Cancer Society -- which has hosted the annual event at Mar-a-Lago for at least the past decade -- has not yet selected another venue. The decision was reported earlier by the Palm Beach Post. The health organization last hosted its gala in Trump's Palm Beach club in February of this year. That event coincided with a visit from Trump, who was in Florida the same weekend to meet with Japanese Prime Minister Shinzo Abe. It's not clear whether Trump attended any portion of the American Cancer Society's event, but he is known to pop in on fundraisers. In fact, Trump served as a co-chair for the American Cancer Society's annual event in 2014, the organization said. Only one other organization, Kravis Center for the Performing Arts, responded to CNNMoney's inquiries. That group confirmed it will host a wine auction at the club on Feb. 1. - An earlier version of this story misidentified the location of the American Friends of Magen David Adom.